The Sport Entry Forms are used by competing Islands to indicate which Sports and Events they intend to participate in at the Island Games. Normally Islands can begin to fill these forms in up to a year before the Games are actually going to take place and therefore they enable the Host Island to know roughly what kind of numbers they can expect before Registration begins. 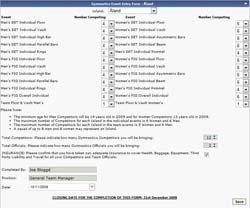 At the basic level is the actual Sport Entry Form; here an Island will indicate which sports they intend to participate in and the the number of male / female competitors and officials they are likely to send for each sport. Then for each of the events they do intend to particpate in their is also an Event Entry Form. 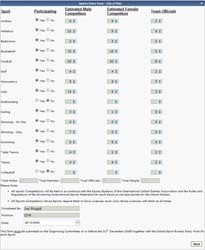 This lists all of the events that are available for that sport with the host Island selecting from a dropdown the number of competitors / teams they intend to enter into that particular event. In order to manage the completion of these forms once the deadline for their completion has passed it is possible for Site Administrators to set the forms as view only in order to prevent the Islands from making any changes. This can either be done on a per user basis, or for all Islands at just the click of a button. As with all information in the system, the Islands can only see and complete their own form, and the reports are also restricted to their Island. For more information about security and what different site users can do in Exis Admin please visit the Users and Security page. The information entered onto these forms is therefore very useful to the Organisers as it enables them to begin planning at a very early stage. It is also useful for the competing Islands as they can get a clearer picture of what events they are going to compete in and how many people they are going to send. Once the forms have been completed, the Island then has the option to generate a PDF document of the completed form so that the information can be printed of. Also available on the site are blank versions of each of the forms so the Islands can print them and fill them in offline. To make sense of this information there are five different reports that can used by the Games Organisers or the Islands themselves.